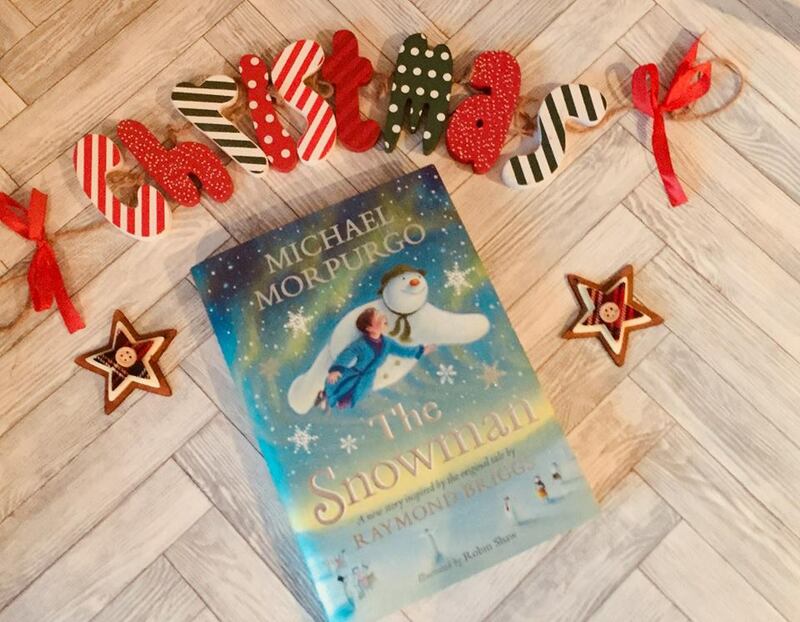 It can be so hard to know what to buy children these days as there is simply so much choice and most often the children themselves will change their minds from one day to the next which really isn’t very helpful for parents, friends, or of course Santa himself. Having got two primary aged boys myself I thought I would compile a list of gift ideas that I think would be suitable for them and hopefully it will give you guys some inspiration too. 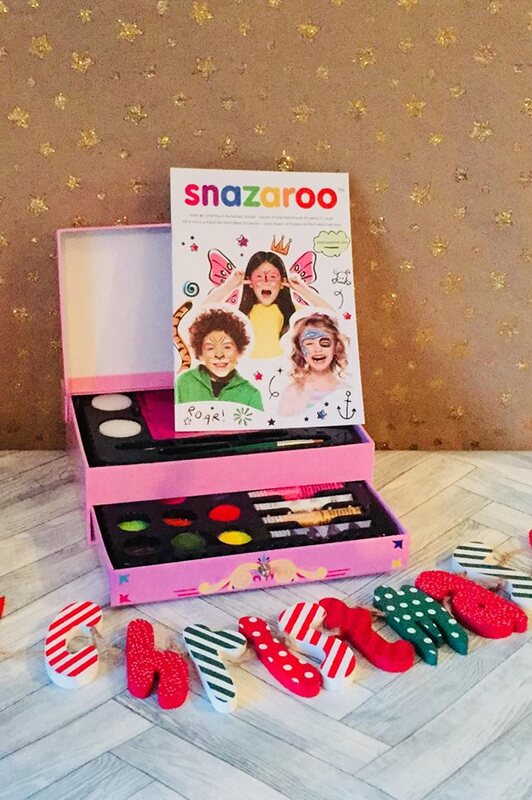 Anyone that knows me knows I love educational gifts for children, especially if the learning element is disguised by play, so lets start with the educational gifts that are top of my list this year. This 2 in 1 globe will make a great educational gift for an inquisitive mind or space lover. Not only will it make a lovely addition to their bedroom and work as a night light it will also show them what the world looks like by day, the different countries, the equator and various oceans as well as showing them what the world looks like at night from space with the click of a button. This globe is available from Reroom for £35. Reroom have a selection of lovely gift ideas and another one that caught my eye is the Space torch for £8 which would make a great stocking filler. Of course this isn’t just any torch but one that can project 24 colour images from NASA straight onto your child’s bedroom wall. A great gift t hat will not only entertain them but also spark conversation and feed their imaginations as they transfer their rooms in to outer space. As a total book worm I love giving the gift of books to other people, especially my children who seem to love them as much as I do. My favourite ones are those we can read or work through together which is why these STEM activity books make the perfect Christmas gift. 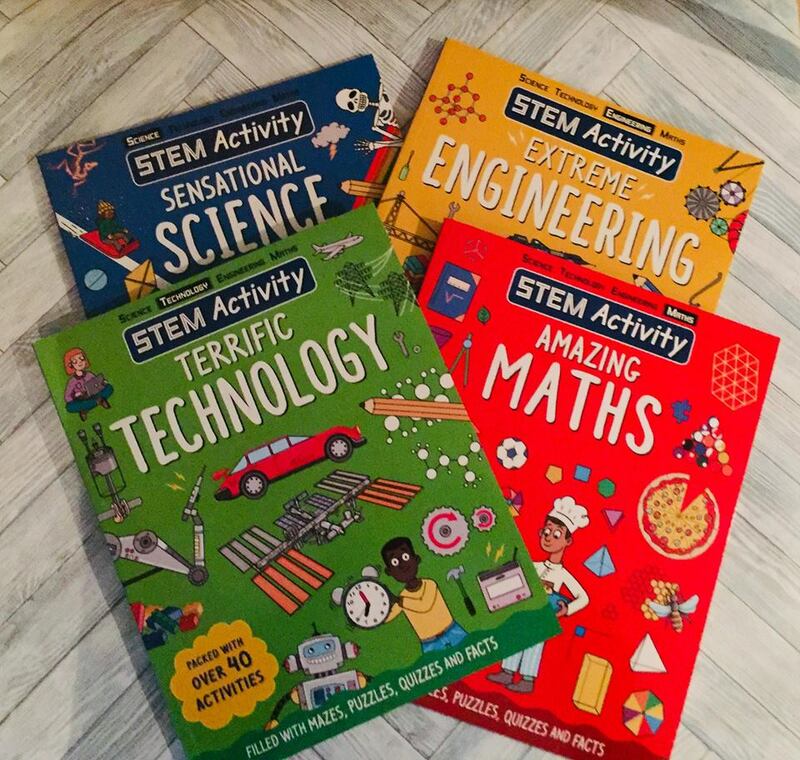 Available covering each of the four STEM subjects, science, technology, engineering and math, you can choose to focus on just one for £9.99 or buy the set from Carlton books for £39.96. These books are great for boys and girls and once again focus on making learning fun with activities, experiments and puzzles that you can work on with your child or that they can try on their own. Sometimes it can be really hard to know what to buy a child for Christmas as they already seem to have everything they want and need and as they get older and play with physical toys less and less it get’s increasingly difficult, which is when activity vouchers become the ideal gift idea. 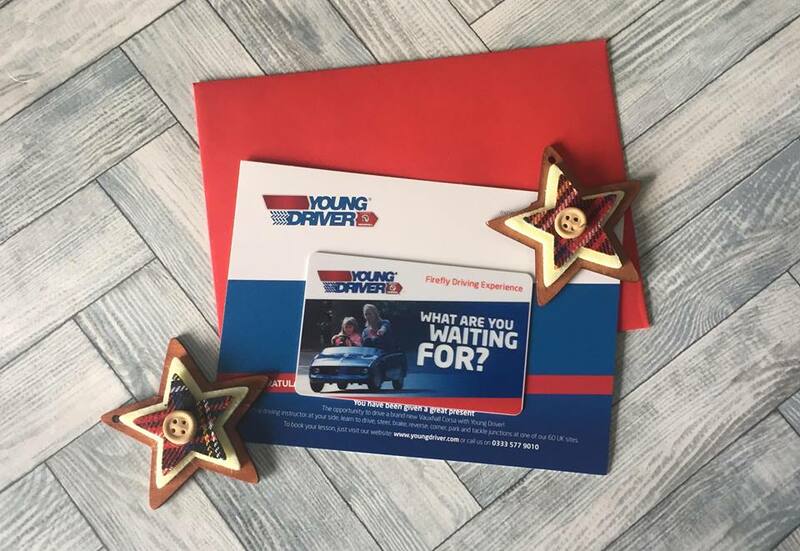 My boys loved their driving experience with Young driver and I can highly recommend this as a gift idea. Not only is it something that they can look forward to after the mania of Christmas has blown over but it is also something they will remember years later as their first ever driving lesson. For £21.49 Young driver offer 5-10 year olds the chance to be in full control of a firefly car on a track or in a car park designed to look like a track for 20 minutes. Here they will have to learn how to use the car and follow the rules of the road, including stop signs and giving way at roundabouts. It is a really fun yet educational experience for them and one that will stand out from the other gifts they receive. Project Mc2 is a range of educational toys based on a program where 4 teenage girls use their science skills to save the day. It is a fantastic idea that is encouraging more girls to get involved with STEM based projects and although originally aimed at girls I personally think the products will be enjoyed by both boys and girls. For instance this perfume science kit is a great way to get children interested in chemistry and they don’t need to make the perfume for themselves they could always make it for their mum, sisters, or other females in their lives, after all the fun is in the creating and leaning not necessarily the wearing of the perfume. 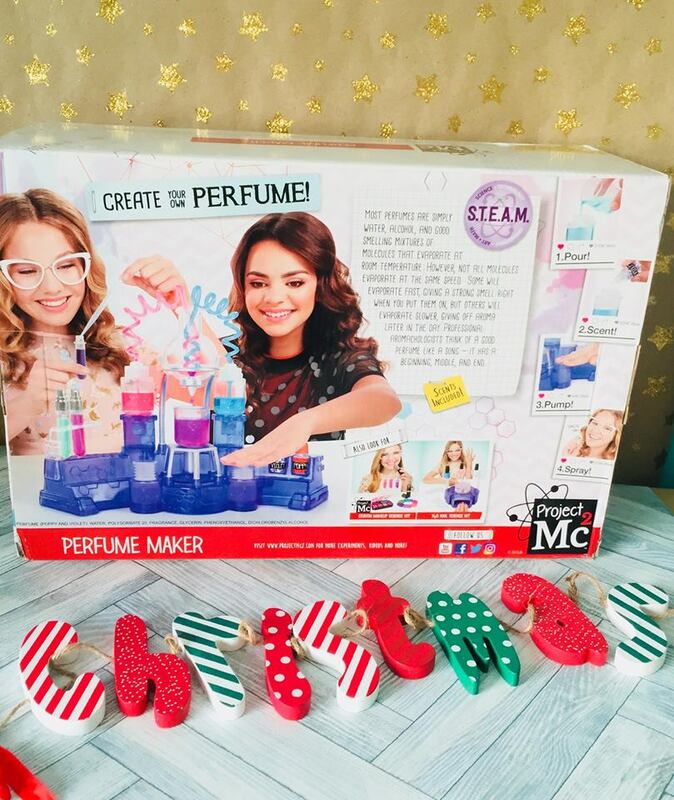 As well as perfume science kit which is available on amazon for £29.99 there is also a science lab kit for £38.47 and lip balm making set for £23.99. 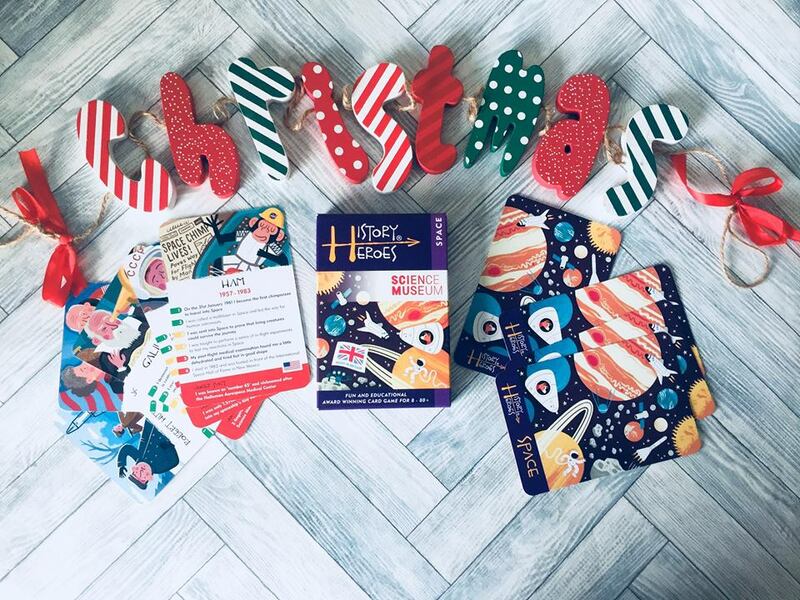 When I was looking for educational gift ideas I found these History Hero card games that are licensed by the Science museum and are available on Amazon for £9.99 and I think they would make great gifts or stocking fillers. They are small and easy to carry so great for playing on long journeys or taking on holiday with you and can be played in small pockets of time as quick fire questions or over a longer period of time as a full game. They are made up of a series of clues about a given historical figure, place or event and you or your child has to guess who or what is being described, the quicker you guess the more points you get. A great game for teaching history and also for testing their memories. 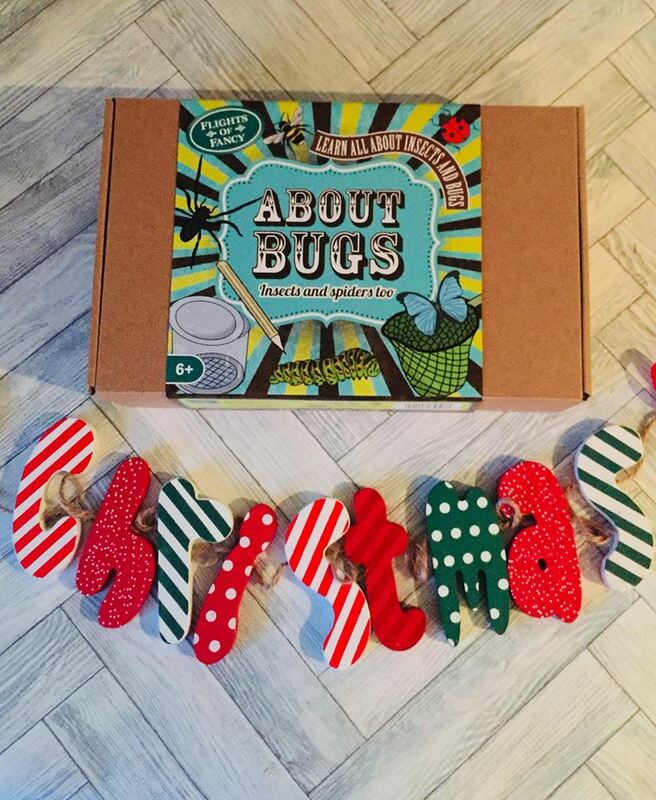 My youngest, like many primary school children, loves bugs and somehow managed to persuade us to get him an African Land snail for a pet not so long ago so when I found this About Bugs Kit I just knew it would be a great gift idea. The set contains a notepad and pencil, a small net, a capture jar and 24 information cards and is available from the RSPB for £11.99. Not only is this gift a great idea for the child but as you are buying it from the RSPB charity you are helping them too. My boys, like most children, love chocolate and every year we always get them some, whether it is a selection box or Christmas shaped novelty pieces there is always chocolate of some description under the tree. This year however, I have discovered a beautiful chocolatier based in London called Coco and Heart where they hand make a variety of gorgeous chocolate bars and novelty figures including these lego bricks and lego men that I just know my boys will love. 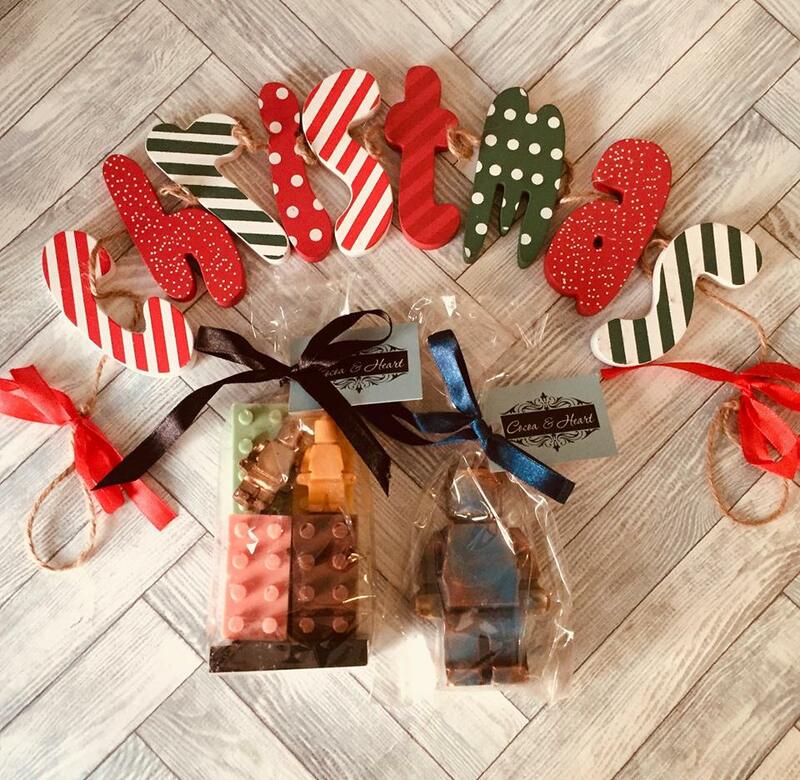 The lego brick set contains a selection of milk, white and dark chocolate bricks and figures and is an amazing £5.95 and the single large lego figure which is made of solid chocolate is priced at £3.95, fantastic value for such intricate designs and delicious chocolate. For our dinosaur mad 6 year old this T-rex fingerling is sure to be a huge hit. We have already got the original monkey fingerling which has kept him entertained for hours and currently has it’s own bedroom and toilette paper bed that was loving made for him and no doubt this new version will soon be joining him. The interactive toy responds to touch and has various noises and movements that your little one can learn as he trains him as his pet. 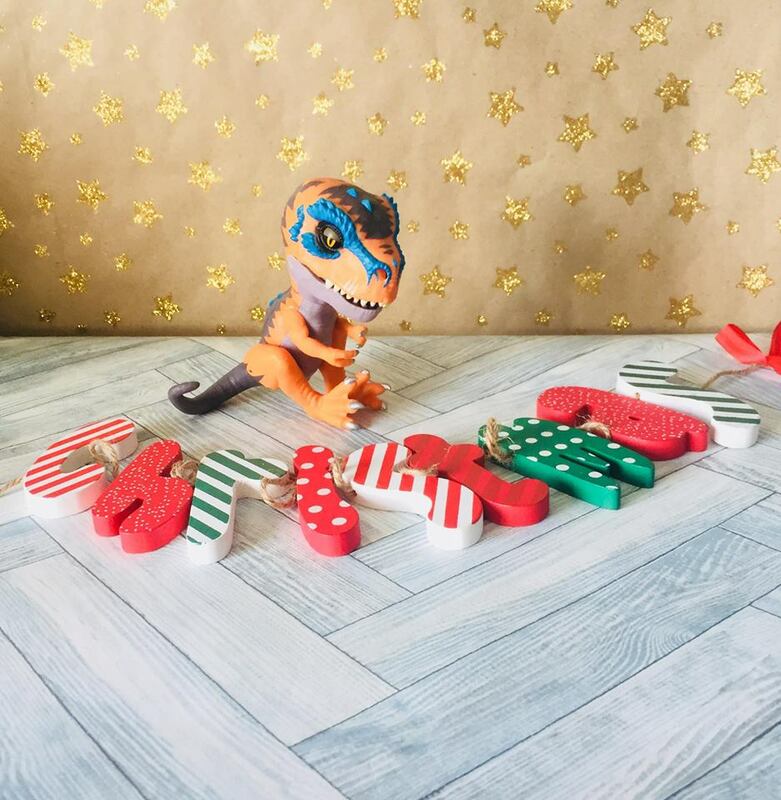 The T-rex fingerlings are available from amazon for £15 in four different colors. 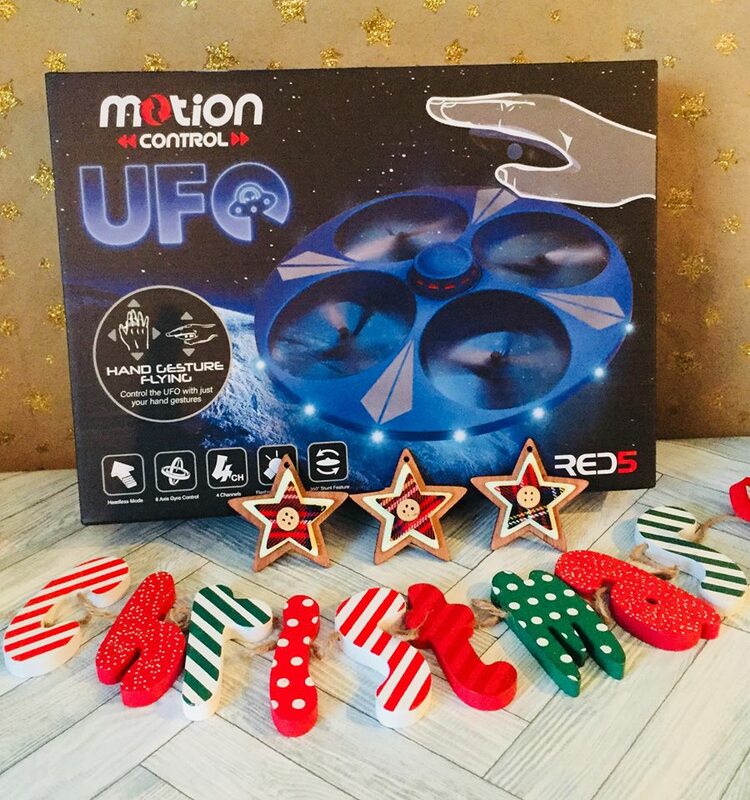 If you are looking for a more grown up toy for your child this Christmas then check out this motion control UFO from Menkind for £39.99. This incredible UFO drone is one that adults and children will enjoy controlling using simple hand gestures and with the led lights it can be used day or night. In a bid to get the boys away from technology we often purchase craft activities that they can work on together and this one looks brilliant. 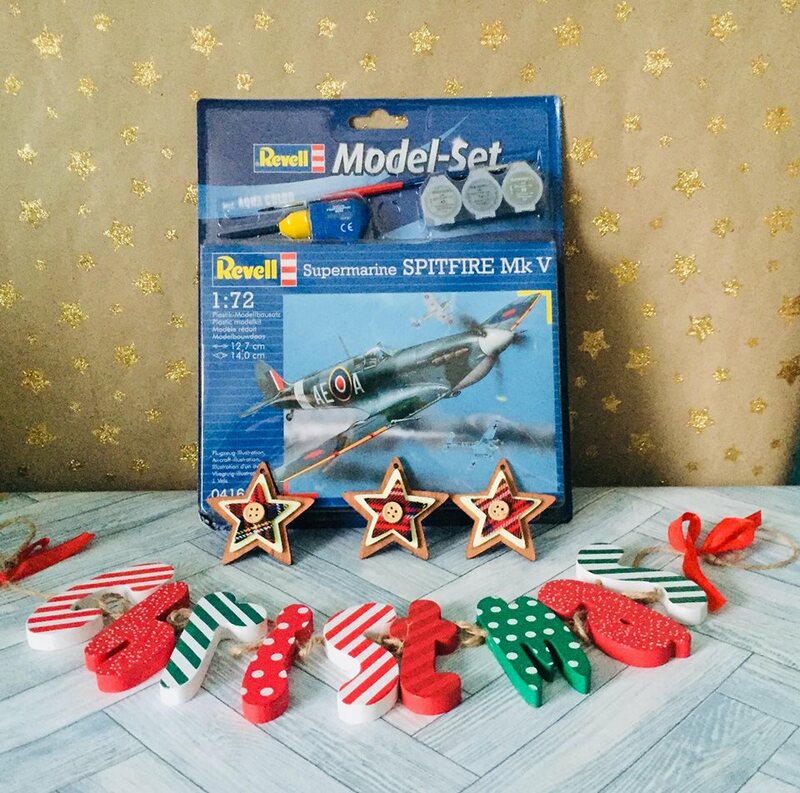 It is a model plane set that requires them to build the spitfire following the instructions and then paint it once completed. This set will keep them busy for hours, help improve fine motor skills and give them something to be proud of on completion. There are a number of designs to choose form but my favourite is this spitfire one that I know will remind my son of his favourite David Walliams book, Grandpa’s great escape. Grab yours from Hobby craft for only £10. 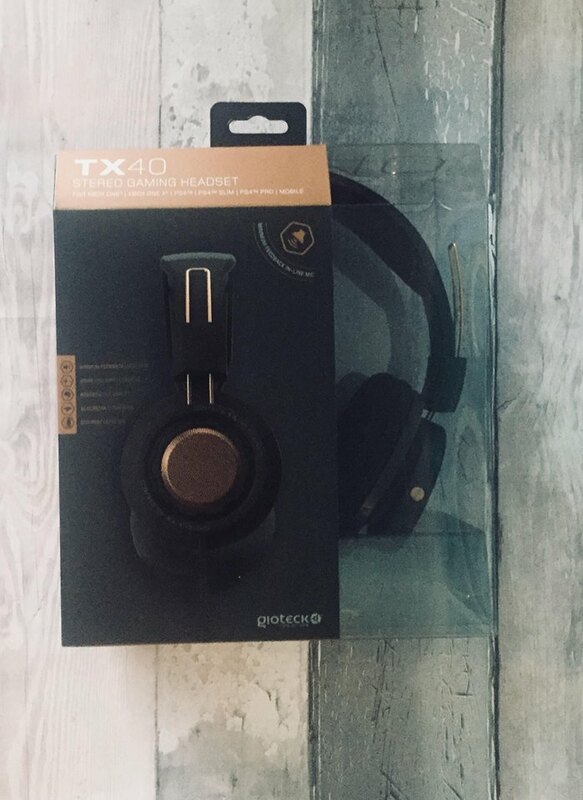 For the older kids who love to game, how about a TX040 Gioteck Stereo Gaming and Go Headset from Argos which is currently only £13.99. The TX-40 are specifically designed to work alongside Xbox one, Xbox one X, PS4, PS4 slim, and PS4 pro. They look stylish in black and copper which also makes them unisex and the size adjusters mean they can grow with your child or even be shared by siblings. The TX-40 also offer minimum feedback, alcantra cushioning and a discreet inline mic. 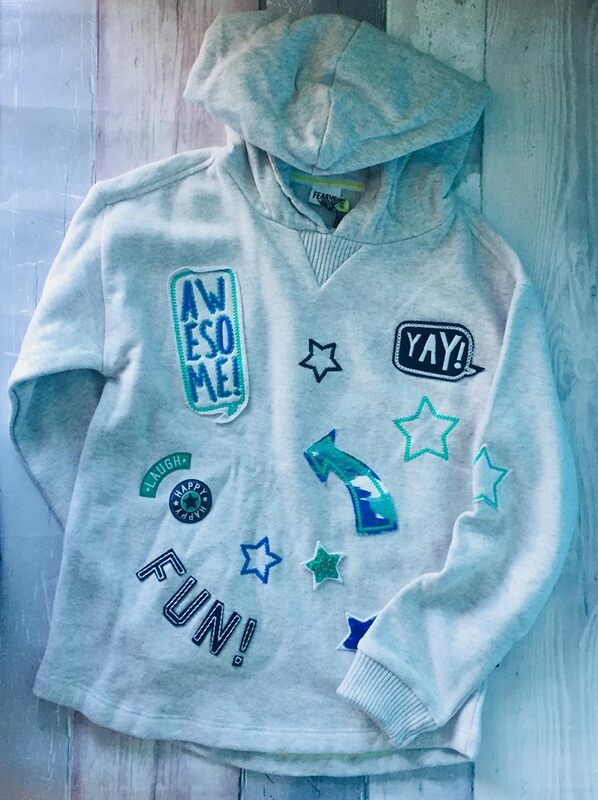 Christmas is a great time to top up the children’s wardrobes with a few key pieces for the winter months and as I recently discovered that the Boots mini club clothing range now goes up to age 6-7 it will definitely be being purchased for out very own tiddler, especially the beautiful and some what quirky items from the Fern cotton range. 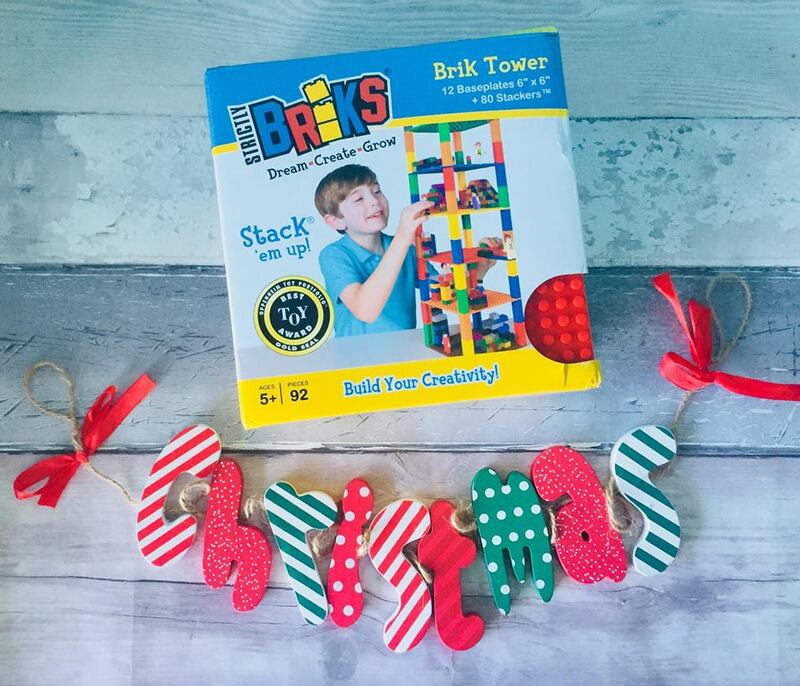 We recently reviewed the classic trap and gap strictly briks set and found them fun, affordable, easy to use and compatible with leading brick companies and so we think these will make a great gift this year. There are many sets to choose from and they are available from amazon from £4.99 with the stack ’em up! set featured below costing £24.99 which comes with 12 baseplates and 80 stackers. If you have any other great gift ideas for primary school aged children be sure to share them with us and if you are looking for gift ideas for the men in your life then check out our men’s gift guide or for the ladies check out our women’s gift guide. 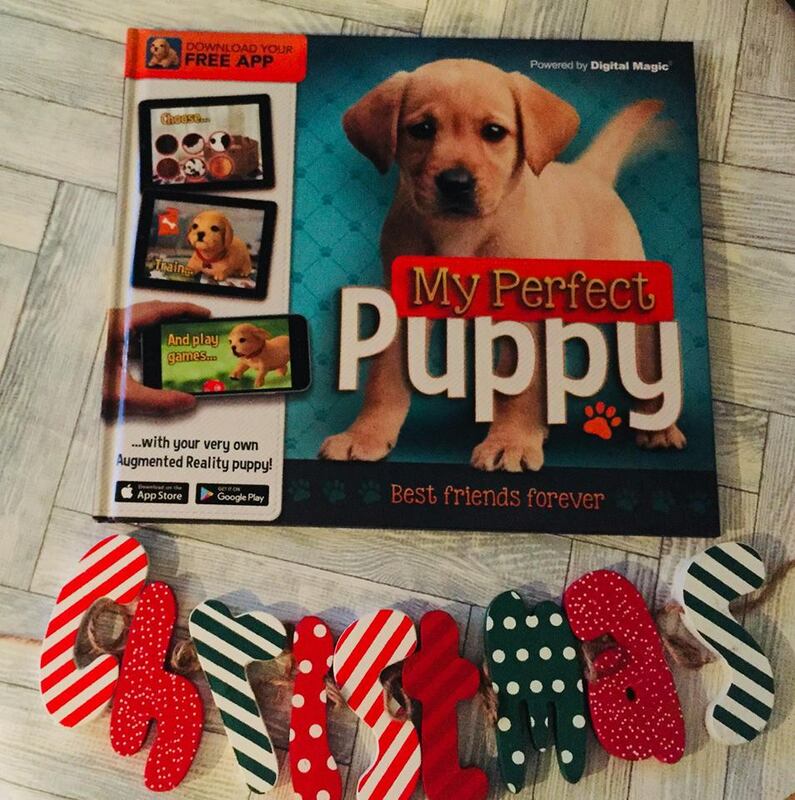 This year I haven’t written a babies Christmas gift guide but I can recommend this one by Welsh mum of one. No Christmas is complete without a new board game and this Guinness Word Records Challenges look brilliant for the whole family. It will see you compete against each other to be the first person to complete three challenges and cross the finish line to be crowned the winner. With 60 questions to answer and 20 challenges to attempt this is sure to be a game that gets you thinking, moving, and laughing all at the same time. (Some of these items were gifted to us for the purpose of this gift guide but all opinions are my own. Luisa got that space torch for her birthday – it’s seriously cool! There’s a great selection of gift ideas here and lots that I haven’t heard of before. My daughter would love the stem activity books and also the UFO toy. 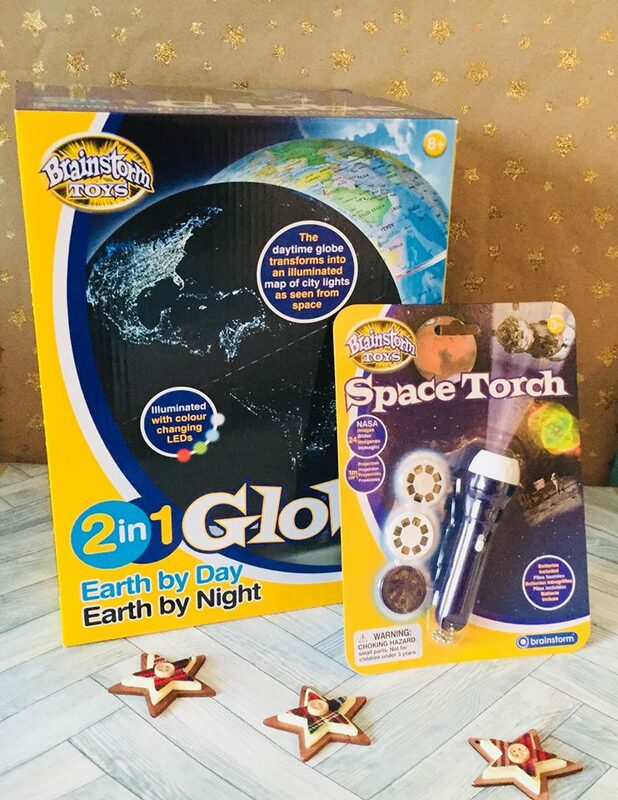 Some lovely gift ideas here I love the look of the globe and space torch my daughter would love that! So many great ideas here. I am always trying to find stuff that is educational and will last well. I love these ideas, especially love the globe and torch. i think I’ll add that to Bugs list for this year. He will love them!